Justin Kilbride knows first-hand just how big high school football is in Texas. He has spent time in the Lone Star State over the years and has seen some of the stadiums that draw thousands of fans on Friday nights during the fall. The new Memorial Stadium, which opens on Oct. 8 for the Vacaville-Napa Monticello Empire League game, won’t be bigger than the ones in Texas. But it will definitely be better, said Kilbride, who is overseeing the stadium project as construction manager for RGM and Associates. “It’s an amazing design,” said Kilbride. “It’s just very unique for anything on the west coast and in California. The old Memorial Stadium — which served the community for 58 years and gained national recognition from The Sporting News and ESPNRISE.com as one of the top places in the country for high-school football — was torn down in late December and early January. It was an aging facility that required continual structural repair work. 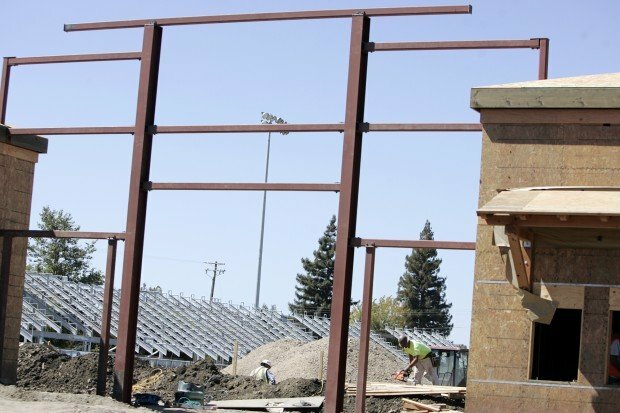 An excavator was used to tear down the historic stadium, which is shared by Napa and Vintage high schools. Just about everything came out — the cement bleachers, Quonset huts, press boxes, concession buildings, scoreboard, goal posts and grass field. The light standards are still in place. “It was important for us to tear it down, there was no choice,” said Don Evans, the director of school planning and construction for the Napa Valley Unified School District. The stadium is being rebuilt, thanks to the passage of Measure G in November of 2006. 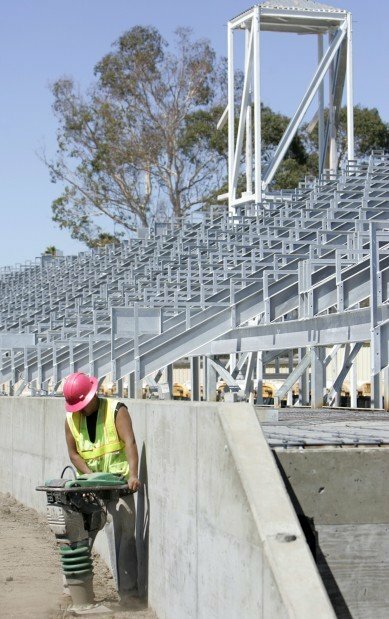 The modernized complex, which will cost between $12.5 million to $13 million, will feature increased aluminum bleacher seating that will accommodate 6,400 fans, a grand entrance and plaza level at the south end that will feature a stucco wall, a synthetic field, team rooms, concession areas, press boxes, elevators and a sound system. The new scoreboard at the south end will be 25 feet wide and eight feet tall. The previous seating capacity was 3,400. With added temporary bleacher seating for events such as the annual Big Game, the new stadium’s capacity can expand to 8,000. “We paid lots of money to provide the spectators with a commanding view of this facility,” said Evans. The new Memorial Stadium was designed by Jay Beals & Associates from Sacramento and Quattrocchi Kwok Architects from Santa Rosa. “This is a state-of-the-art facility for a high school football team,” said Riley. “It’s just going to be awesome. You’re right on top of the field still. There’s not a bad seat here. Memorial Stadium will be getting FieldTurf Duraspine PRO, the same product that the NFL’s New England Patriots play on at Gillette Stadium in Foxborough, Mass. “That’s a plus for our community, in particular for the young people that will be playing on it,” said Evans. Ticket booths and additional restrooms are part of the upgrades. The project will also come with a new parking lot near the entrance, although there will be fewer spaces to park because of the stadium’s size. The field will sit four feet below the team room areas, located at the north end, eight feet below the promenade deck in the stands, and four feet below the plaza area. Making the facility all the more unique is that there is no track around the field, just like the old stadium. The stadium will be used for football, boys and girls soccer and graduations. It will also be handicapped-accessible, with ramps and seating areas on the promenade level. “We have created a bowl effect, which no one wanted to lose,” said Evans. “We’ve created seating that takes it right down to the field on both sides, as well as getting great seating up above on both sides. The stadium has been designed so that fans have unobstructed views of the action on the field. Before, if you were seated in the first three rows of the old stadium, there was constant foot traffic in front of you. “I think once the teams get to using it, I think the schools that come to visit us and play us are going to be overwhelmed,” said Evans. The team rooms are 3,000 square feet. Players won’t have to be hunched over, like they were before, in the old Quonset huts. The press boxes will also be larger, in order to accommodate announcers, coaches, media and staff. Elevators will be used to assist the handicapped and those using the press boxes. “We’re going to be able to provide to both home media and visiting media something that is going to be pretty special. I would venture that we will again be recognized as an outstanding facility, especially at the high school level,” said Evans. Workers lost 50 days due to rainy weather last winter, but are making up that time with six 10-hour days per week. The school district has allocated additional money for the project. “We took corrected measures and re-adjusted the schedule,” said Kilbride. R E Maher (concrete), Vorhees (plumbing) and Solano County Roofing have worked on the project. There have been anywhere from 40 to 70 workers a day on the job site. “I have the utmost confidence in both our general contractor and our construction management team,” said Evans. Beals Alliance is in charge of the landscape architecture. ‎"The school district has allocated additional money for the project." Really... hhhmmmm. Has anyone, ANYONE, asked where the additional money is coming from? Just want to add that the other quote about the old stadium needing to be torn down was from the contractor who's making money off the new construction. "“It was important for us to tear it down, there was no choice,” said Don Evans, the director of school planning and construction for the Napa Valley Unified School District." This coming from the guy who approves of throwing away perfectly good school furniture... Yeah, if Don Evans says it needed to be torn down, it needed to be torn down. So the seating capacity is almost doubled (or more than doubled, with for certain events) -- with fewer parking spaces. Does that make any sense? Of COURSE there are advantages to synthetic turf. They are cheaper and easier to maintain, and the salesman will tell you that the newer turfs aren't as bad as the old turfs were with regards to knee injuries. And besides, the surgeons are MUCH better than they used to be. So that makes it even more less bad. But the budget friendly turfs are STILL WAY more dangerous, orthopedically, than real grass, and on a hot day can be 20 degrees hotter. But if all the other schools have decided that the more hazardous surfaces are cheaper, even though they are more dngerous to the students, why should I care about our young people's future? But, please, get rid of the soda machines ? Agree with Tiredofcomplainingnapkins. I know who you are #3. This is #1. What's RJ up to? Who made the decision to use artificial turf ? It sounds like someone paid a lot of attention to a "synthetic" turf salesman. I really want to know who is responsible for the decision to use artificial turf. Was that a contractor's decision, or was it a NVUSD decision ? And IF it IS a NVUSD decision, who was responsible for it? Was it decided to use the artificial turf after the NVUSD's legal staff decided that they would not be liable for what could be crippling injuries to our teenagers ? Was maintenance the deciding factor ? Was water use more important than the health of our kids ? Yes, I KNOW that the new "synthetic" turfs are better than the old Monsanto rugs. But that's a smokescreen, in my opinion. It is STILL not as safe as real grass. DeSPITE what the salesman said. I wouldn't have let my son play on a rug. I'm sure the legal department told them it would be safe in court. But football isn't played on a court. Memorial Stadium ain't got nothing on the Berry Center here outside Houston.